Today an international campaign was launched to make the EU withdraw its vessels from the waters offshore the occupied territory of Western Sahara. Press release, 6 November 2009. Today an international campaign was launched to make the EU withdraw its vessels from the waters offshore the occupied territory of Western Sahara. The campaign urges the European Commission to put an immediate stop to the granting of licenses to EU vessels fishing in the waters offshore Western Sahara, and demands that no further EU fisheries operations take place in Western Sahara until a peaceful solution to the conflict has been found. “Transferring EU tax money to the Government of Morocco so that EU fishing industry can get access to the waters offshore a territory which is illegally occupied, is fundamentally unethical. It is completely counter-productive vis-à-vis the UN’s efforts to decolonise Western Sahara, and clearly contributes to prolong the sufferings of the Sahrawi people,” stated Sara Eyckmans of Western Sahara Resource Watch. 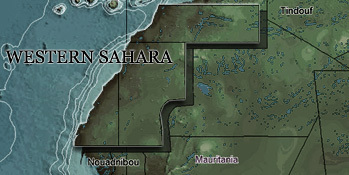 In 2006, when the agreement was initially passed, Sweden voted against, stating that the vagueness of the territorial applicability could allow for the EU to fish in Western Sahara, which would be illegal. At that period, it was still unclear whether fisheries would in fact take place offshore the territory - although such had been the case under previous agreements. And the current proved to be no exception. Last year, the European Commission admitted to ongoing fisheries in the waters offshore the occupied territory, under the fisheries agreement with Morocco. The European Commission claimed legal support for these activities in a UN legal opinion. The author of the opinion, however, the former UN undersecretary-general for legal affairs, Mr. Hans Corell, has reacted strongly against the EU’s misuse of his analysis. He says that there is no room for such an interpretation of his legal opinion, and that he is “embarrassed” to be European after the EU’s decision to fish in Western Sahara. Morocco began its occupation of Western Sahara on 6 November 1975, 34 years ago. Since then, a large part of the people of Western Sahara has been living as refugees in Algeria. The Sahrawi people is against the agreement, and has not been consulted prior to it being inked by Morocco and the EU. Individuals and organisations are invited to sign a protest to the European Commission at www.fishelsewhere.eu. The campaign is initiated by Western Sahara Resource Watch, an international organisation represented in 35 countries, researching and campaigning the plundering of the natural resources in occupied Western Sahara. www.wsrw.org.